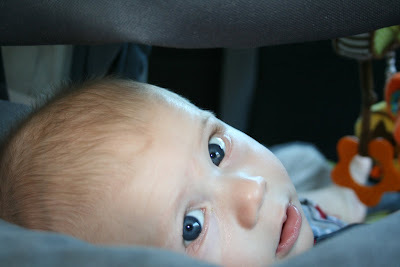 This is a picture of Max in his car seat looking back at me in the drivers seat. It makes it hard to keep my eyes on the road when I've this view behind me. I love when he looks up at me like this from his car seat. Sometimes he falls asleep in this position. Looking up at mom. I love having a little buddy! It's so fun to cruise around town and run errands with my best bud. Sometimes I hope for a red light so I can look back at him and talk to him. Thanks Max for being my best little bud.